In my opinion cleansing is one of the most, if not the most, important part of any beauty regime. We can buy as many expensive creams and serums as we like, but if you’re not removing the daily build-up of grime and residue then they won’t be able to penetrate deep down enough to really make an impact. 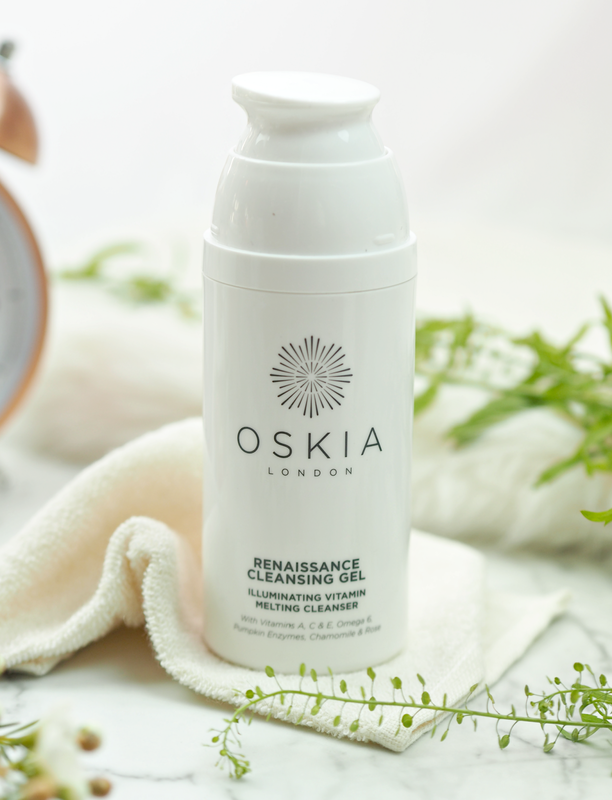 Although I’d happily scrimp on a mascara or body lotion, my cleanser will always be top of my priority list: I see such a difference when I’m using a great one, and using it properly. Cleansing may seem like a basic process that’s hard to get wrong, but it’s also one of the most misunderstood elements of beauty; whether that’s relying on a face wipe, scrubbing too much or making your eyes all stingy, there are ways to make the process easier, more effective and enjoyable too. So here are the mistakes that you could be making without knowing – and how to fix them. Although I’m definitely in the lazy camp of preferring to use cleansers that remove every trace of mascara, removing your eye makeup separately with a dual-phase cleansing lotion can actually be more beneficial than you realise. Many mascaras and eyeshadow have a high concentration of talc, which is a drying agent; when washed onto the delicate eye area it can not only cause irritation, but it could actually zap the area of moisture and cause those little fine lines to become even more noticeable. These makeup products can also sting the eyes if you accidentally wash residue into them, so play it safe and quickly wipe away makeup before you pop open the cleanser. the upper layers of skin which can cause spots, irritation and blocked pores. Although they can be great as a first step or in an emergency situation (festivals, planes and at 3am!) they’re not what you should be relying on for a thorough cleanse; a balm or oil is the only way to go in my opinion. As a general rule I personally prefer to avoid anything that foams during an evening cleanse, as these foaming formulas can strip the skin of goodness and leave it feeling tight. I prefer to leave these in my shower for a quick morning cleanse instead (which helps remove dead skin cells and product residue from overnight.) Since I’ve been using cleansing balms and oils I haven’t looked back; they’re much gentler on the skin and can actually *add* goodness, rather than taking it away. 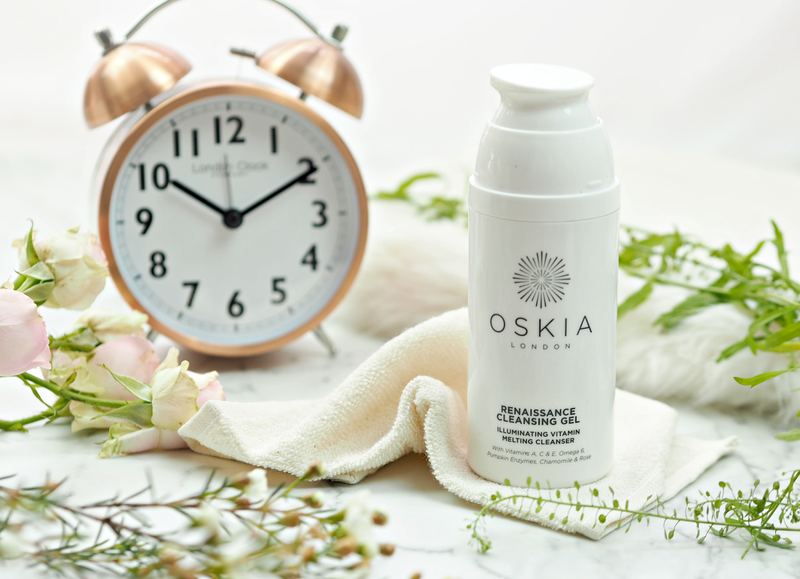 My current fave is this Oskia Renaissance Cleansing Balm (£29.50) which removes all traces of makeup and dirt from my skin, leaving it feeling plump and fresh – just don’t get it in your eyes, because it stings! residue; don’t blast your skin with freezing cold water either! The reason I’m such a fan of the double cleanse is because the first round doesn’t always get rid of all that dirt and grime. Generally speaking, I wear a lot of makeup and use a lot of skincare products – so my cleanser has to work hard to remove it all at the end of the day. My first cleanse removes the makeup and dirt you can see, but the second removes it from the lower layers that you can’t; the result is squeaky clean skin that’s ready for my night creams. If you don’t completely remove all traces of makeup (or worse, all traces of cleanser,) then this could cause irritation, breakouts or blocked pores. oil or balm on those other days so as not to damage the surface. My bathroom is stacked high with muslin clothes and flannels; on laundry day there’s often a whole rail saved just for these little white squares too. It’s so important to use a clean face cloth every day (or every other day if you’re not removing makeup) so you’re effectively washing away grime and not just scrubbing it back onto your face again. You don’t need to spend a fortune on face cloths (mine come from Primark and are about £2.00 for a pack of five,) but do ensure you have a big enough stash to see you from one week to the next. Have you learned a thing or two about effective cleansing? Which tip will you be integrating into your regime? If you’ve got any other top cleansing tips, please let me know in the comments below! 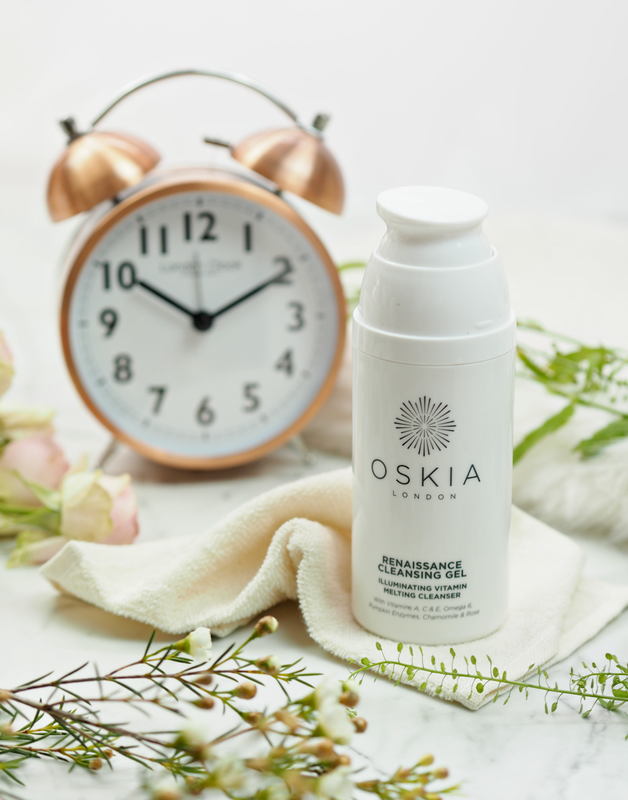 The Oskia Renaissance Cleansing Balm (£29.50) is available online and in department stores. Thanks Chantalle! I think you're so right – when you've swapped in for an oil and can see the benefits you're never able to go back to micellar. Glad it's worked for you! Ouch! Try to turn down the heat – it's actually bad for your body if you have your shower too hot too. I love the feeling of massaging it all off my face at the end of the day! As much of a ritual as it is about the effectiveness. Me too! I try sometimes to just fall asleep but I have to get up and go cleanse or I can't, ha. Definitely some great tips here. I know very well than oil cleansers are better for the skin but yet, I am not the biggest fan as it takes longer to cleanse the face with them comparing to the usual face washes. I do however have some samples at home which I occasionally use – the results are amazing but I just cannot be bothered to do it every day! I really enjoyed this post, it was really interesting! One thing I have noticed with my extremely dehydrated, acne prone skin is that Micellar water is my saviour. I agree with your comments about not relying solely on Micellar Water as a general rule. However I have found that cutting out cleansing, shower/tap water and only consistently using Micellar Water to remove makeup followed by moisturiser is the ONLY thing that has cleared up my acne in over 3 years of suffering with adult acne. Just goes to show how different everyone's skin is.